HI THERE LOCAL! THANKS FOR YOUR HOSPITALITY IN HOSTING THE WARBY TRAIL FEST IN YOUR VALLEY! Hopefully you’ve had a look around the rest of the website and got the general gist of what the event is about! It is a trail running event with a mixed bag of distances on offer, designed to cater to all kinds of off-road runners at all levels, with an inclusive atmosphere that beyond simply running, is designed to celebrate the mountain lifestyle, which Warburton so perfectly epitomises. A few of you may have already seen the odd mention on social media or heard through the grapevine of the event. We are more than aware that whenever an event comes to a town, there will always be concerns and questions as to what it is about, and how it may impact local residents and businesses, and I'd like to take this opportunity to once again extend an anytime invitation to connect with me to discuss any aspect of the event. I am hoping we can all continue to build the event into one that is wholly inclusive of local businesses and residents, be that as participants celebrating your own awesome backyard full of trails, or as stakeholders in the event, be that as sponsors, engaged businesses or volunteers. As an indicative measure, in 2018 (inaugural year) we aimed to achieve 400 registrations. In the end we nudged to 500 registrations. Importantly, the baseline economic stimulus was in excess of $220,000 (expenditure in the region by 2018 event participants and management). So what is Warburton Trail Fest (WTF)? WTF is an event that offers multiple run distances for participant runners over a three day long weekend. It is designed to be inclusive, family friendly and varied in its challenges on offer to cater to all trail runners from beginner to experienced. Distances will vary between 50km and 4.5km. Why a running event in the first place? This event is specifically designed to showcase the stunning natural environment and varied trails on offer for visitors across the Valley, with an outcome of increasing exposure to a target visitation market (active travellers) and increasing overall visitation / tourism well beyond just the event weekend as participants return to the Valley to train (for the event, but also in general) and also just enjoy the trails on offer year-round. Warburton is already a prime target for trail runners training (Donna Bang in particular is well known in the trail running community for its ascent profile). Part of the drive for WTF is to expose trail runners to trails beyond just Donna Buang, and encourage year round visitation and use of trails in the Valley. The combined outcome is increased economic stimulus across accommodation, tourism services (i.e. MTB hire / tours), attractions (galleries etc), food and catering, and general retail. What about Up and Running - we already have a running event around that time of the year? The managers of U&R have been consulted by Warburton CEDA and are satisfied that the two events represent different markets and indeed can work collaboratively together to cross promote and help build each others' event playing to strengths. U&R is predominantly a road running event, designed to attract the mainstream road running visitor. WTF is specifically a mountain and trail running event designed to leverage into the huge growth in trail running specific markets (trail runners tend not to run on roads and vice versa - although there is some crossover). We believe there will be no impact on U&R in terms of numbers and indeed WTF and its managers are open to working collaboratively with U&R and any other local events to cross promote into our markets. We wholeheartedly support Warburton Up & Running. Why is it not called a 'Run Fest'? The long term plan for the event is to build it into a wholistic celebration of the mountain and trail community lifestyle - this involves designs to extend beyond simply running - we would like to include cycling, walking and other active elements that have as much relevance to celebrating the mountain environment and the trails that allow us access. As the trail infrastructure and mountain tourism grows further in the Valley, we plan to move with that growth and to provide an annual focal point for celebrating the place and environment that is Warburton Valley. 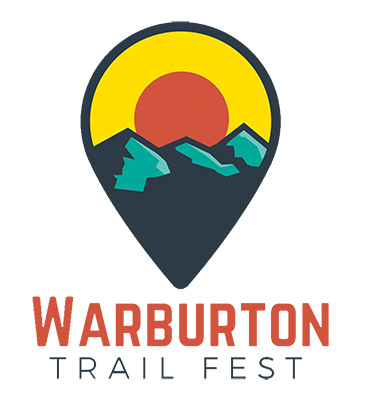 When is Warburton Trail Fest? The event is slated for the March long weekend, 9, 10, 11 March 2019. We will look to hold the event on the March long weekend annually. Why the long weekend - it's already a busy time? The March long weekend was a priority time window for the event, based on the strategic reasoning that a three day period and 'festival' approach encourages longer term visitation (i.e. accommodation bookings), increased tourism spend, and a better engagement with the destination by visitors as a whole. This tends to result in increased return visitation, as visitors get a better sense of what is on offer in the Valley (beyond simply trail running) . The event has a precedent in that Tour de Trails operated a similar three day festival in Tasmania, where the three day design encouraged interstate and long distance visitation. In terms of the event design (which includes a lilo derby) the timing is perfect in terms of being warm enough for such water based activities (and the river low enough to be safe), while the trails will be dry enough specifically Donna Buang Trail). What about parking - won't the event participants clog up the main street? No! Hopefully not. In all our event communications (event program, social media, MC announcements) we make specific reference to the fact that our participants should not park anywhere on the mains street(s) for long period when attending the event (unless they are shopping, of course!). We supply a map with suggested parking locations better suited to not creating congestion in town. Will there be any trails closed or impact on traffic? All trail run event participants are briefed and instructed to show care and courtesy for other trail users at all times. You will find most trail runners a friendly courteous bunch! Apart from peak periods (starting times mainly, along with the short course 4.5km utilising the river trails around the township), most runners are fairly spread out, minimising impact and obviously only for short periods at any one section of trail. There is no impact to traffic, however several runs do cross roads within the Warburton precinct (Mt Donna Buang Rd + some back roads attached to the Walk Into History), so we ask that all take due care driving in those areas during run times. We have CFA on course monitoring road crossings. Runners are instructed that cars have right of way and they must stop and wait and/or take due care crossing at their own risk - even when racing. What about all that marking you put up? We do use reusable pink markers and signage to direct runners including in and around town trails. The marking will be present a few days prior to the event. It is all taken down by close of the event by our dedicated 'sweepers' and usually taken down directly after a run (unless the course is to be re-used for a subsequent run). We have had instances where the sweeps have missed the odd ribbon. Please do alert us to this and we will remove ASAP once event has ended. We take our environmental responsibilities seriously and appreciate your communication in assisting our efforts. Also - we appreciate you ensuring the marking stay in place during the event - it endangers runners when makings are tampered with vandalised or removed. If you suspect some marking has been vandalised / tampered with, please do contact us immediately. We did have instances last year in the Redwoods where an entire course was taken down prior to the run, which endangered our runners putting them at risk of getting lost. We appreciate that pink ribbons are not the most sightly thing in the environment, but also trust that a short time period of impact for the sake of directing runners and their enjoyment of the area, is a small price to pay for the influx of visitation and appreciation they gain for your home and from your hospitality. Thanks in advance for keeping an eye out for our marking! What is trail running all about? Trail running is currently a 'boom sport / recreation'. Its growth has been phenomenal over the past five years with events and participation rates skyrocketing in number. Indeed, there are more trail runners, using more trails, more often in the State than there are mountain bikers (the current 'hot thing' in active tourism). Trail runners exhibit a low-impact engagement with the environment, and in general are always very courteous to other trail users. Like other trail users, the motivations for trail runners aside from fitness and wellbeing, are to explore nature and enjoy the environment that the trails leads them in to. Environmentally, there is no impact on the trails. With last year's successful event attracting 500 registrations (accounting for approx 400 people), we expect this year to show an increase in numbers. Who is behind Warburton Trail Fest? Under another adventure consultancy business, Adventure Types (www.adventuretypes.com), I also conduct tourism consultancy projects with a speciality in the outdoor active/adventure, natural landscapes and trails segments. I have assisted local, regional, state and national governments across many projects including mountain biking development, tracks and trails strategies, and active traveller tourism development plans. Further, via Adventure Types, I have been involved in several consultancies looking to grow the Warburton Valley's trail-based tourism (I was part of a team that audited most of the town's trails, as well as producing a promotional video and photo library for Warburton Valley website). I'm also the editor Trail Run Mag (www.trailrunmag.com), published for the past 8 years), an asset when it comes to understanding the trail run market and also tapping in to it via TRM's channels. Finally, a note I still believe to be important - I grew up in Warburton, attending kindergarten and primary school in town and going to high school in Yarra Junction while living in Warburton until graduation. I played football for Warburton Burras (yes, I can still recite the team song - just ask last year's team captain who joined in a rendition at last year's night run! Onya fellas!). And even after leaving the Valley to pursue university, I owned a house in Warburton for seven years. This note is made in reference to the fact that I am still very passionate about Warburton and its environs, and wholeheartedly believe in its place as a central node of outdoor active and trails-based tourism. How can we (local business, resident etc) be involved? > sponsorship / partnership - offering of prizes, discounts, quid pro quo that assists the event in the organisation and roll out, in return for significant exposure via the event channels and Tour de Trail channels, and promoting visitation to your businesses while visitors are in town (and when they return for leisure visits to the Valley). > volunteerism - no event operates without a core army of volunteers - from marshalling to more complex roles (team management, site management, promotions etc). We welcome any business or individual who would like to offer their time and expertise to the event in order to see it succeed. In exchange we always offer one free entry into any TdT event (including the Fest i.e. you can volunteer on Saturday and run on Sunday for free!) and lunch where volunteering over a 3 hour period or more. > business services - often we are looking for local services to help roll the event out - that may be specific (i.e. a BBQ catering service, or massage services on site), or something we have not thought about yet - i.e. kids jumping castle or entertainment for family). We are open to approaches to discuss! > accommodation - we currently have a shortage of accommodation options for people attending the event!!! If you have an accommodation business in Warburton / Millgrove and/or accommodation options (anyone with a paddock with toilets and flowing water?!) we'd love to hear from you. We are getting many reports that people are not locking in to the event because they cannot find suitable accommodation. Unfortunately the Caravan Park - always a trail runner's favourite! - is full. We are working with the Warburton Primary School on options there but also seeking 1. notifications if your accommodation still has availability so we can advertise to our database 2. ideas for alleviating the shortage! > work experience - similar to volunteering albeit potentially in a more complex / skills based role - i.e we always need photographers / videographers to record the event; or as a small business we are always short of time for marketing and promotional activities and/or local engagements (conversing regularly with sports clubs and the like). Thanks in advance! You can help by following and sharing on social media any of the content we post. Use our promotional material. I have attached our DL flier and A4 poster that you can use on social media / as an attachment to emails etc. That's all fine - but I am concerned about... (fill in the blank)...! Although not now located in Warburton, I do get up there often :) and am happy to meet and have a coffee (yes, I'm a coffee s(k)nob ;)... with anyone and everyone to further explain what WTF is all about. Or alternatively, please feel free to connect with me with any concerns, queries or ideas! I thank all of you in advance for your consideration and hope that like me, you see the opportunity in WTF to build on the Warburton Valley brand, on its potential for outdoor active tourism, and the benefits that flow from such.